WordPress dashboard: download your theme and sign into your WordPress dashboard (e.g., yourdomain.com/wp-admin). Navigate to Appearance > Themes > Add New > Upload, and select your zipped theme folder, click “Install Now”. Once the theme is uploaded you will need to activate it, either with the provided link or under Appearance > Themes. 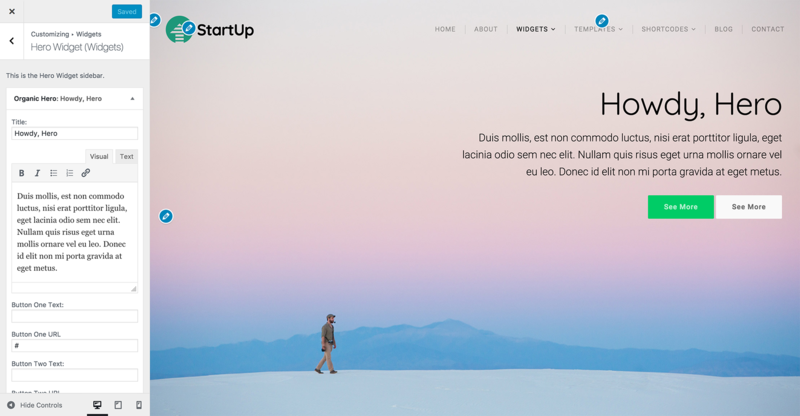 StartUp requires the Organic Customizer Widgets plugin for building custom page layouts, including the home page. The plugin transforms the WordPress customizer into a page builder using custom widgets, allowing you to create pages with dynamic content sections. You will be prompted to install and activate the plugin upon activation of the theme. Demo content can be installed using the One Click Demo Import plugin. Upon activating the theme, you will be recommended to install the plugin. The Jetpack plugin may optionally be used for displaying projects on the Portfolio page template, and testimonials on Testimonials page template. Installation and activate the One Click Demo Import plugin. Click the blue “Import” button for the Default Demo Import. Wait for the import to complete. It may take a few minutes. Note: All content, widgets and customizer options will be imported from the theme demo. Importing demo data will add to any existing content you have already created. Deleting the demo content must be done manually. The theme optionally utilizes shortcodes from the Organic Shortcodes plugin. Please refer to the following links for examples. You can setup and manage your menu under Appearance > Menus, in your WordPress dashboard. The theme utilizes 2 custom menus; a Main Menu, and Social Menu for displaying social media icons in the footer. See the Codex for an explanation of the custom menu system (Note: this tutorial is for WordPress.com, but the process is the same). 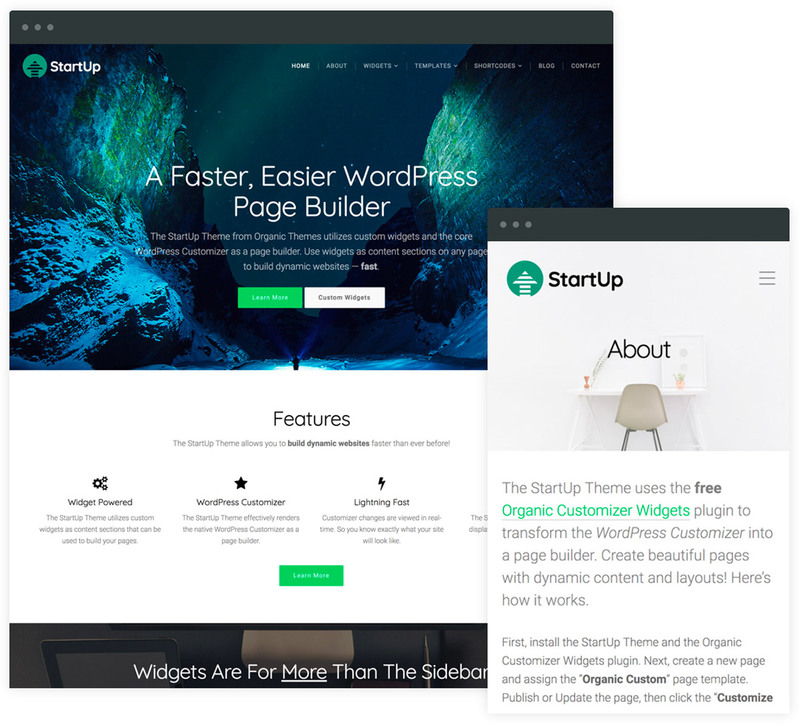 StartUp requires the Organic Customizer Widgets plugin for building custom page layouts, including the home page. The plugin transforms the WordPress customizer into a page builder using custom widgets, allowing you to create pages with dynamic content sections. The plugin allows you to customize the home page however you see fit, by displaying a variety of sections such as content slideshows, hero sections, testimonials, pricing tables and more. Please refer to the tutorial for using the Organic Customizer Widgets. Choose your desired page as the Front page from the dropdown page selection. An image slideshow can be added to the top of a page using the Slideshow page template. Within the page editor, create a gallery using the Add Media button. Insert that gallery into the page content, and the page template will automatically create a slideshow from the gallery. You can manage the position of images within the gallery editor. A “Coming Soon” or “Under Construction” page can be created by using the Landing page template. You can then apply the landing page as your front page within the WordPress Reading settings.